Of all the things you could spend money on, we get that costly HVAC repairs are not at the top of the list. …Which is why it’s crucial to take the time to maintain your current system. By calling professional HVAC contractors to take a closer look, particularly in the spring and fall (although pretty much any time of year is fine here in Southern California), you can solve small issues before they become disasters — and even save some of that cash on your utility bills. Let’s face it: the last thing you want to do on a chilly winter morning is wake up to a cold house that’s just lost its climate control. On a day like that, you won’t want to get out of your warm bed, but you’ll have to in order to take care of furnace repairs (or replacement) ASAP! Similarly, no one wants to come home from a long, hot day at work, regardless of the season, to find that it’s hotter inside than it is outside. Calling for emergency repair during these times will not only cost you a considerable amount of money, but you might struggle to find a pro who can come out because so many other people might be facing the same issue. 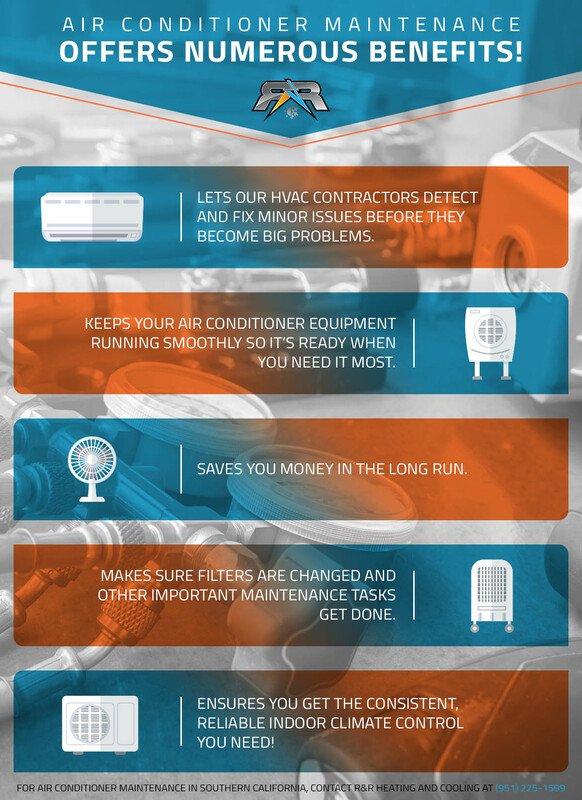 Being proactive about your HVAC maintenance makes all the difference. When you contact R&R Heating and Cooling, we can make sure your air quality is up to par, check that your energy efficiency levels are where they should be, and even reduce your carbon footprint. Get some peace of mind by letting us handle the little adjustments that keep your home cool. In much of the nation, spring and fall are good times to have your HVAC system checked. And while that’s not a bad idea here in Southern California, the truth is that our more temperate climate lets you schedule yearly HVAC maintenance any time of year, when it’s most convenient for you. If you want service in the middle of winter, no problem! The professional HVAC contractors at R&R Heating and Cooling will be happy to schedule your furnace and air conditioning maintenance appointment during wintertime. Don’t wait until your air conditioner is acting up. Give R&R Heating and Cooling a call today to schedule your air conditioning service and maintenance appointment with us. We are an HVAC company that knows the heating and cooling needs of Southern California well, and we proudly serve Anaheim, Irvine, Palm Springs, Temecula, and all the surrounding communities. Regardless of whether it’s your air conditioning unit or your furnace that’s acting up or that has been neglected for far too long, we can help. Reach out to us today to schedule your AC maintenance appointment. We’ll keep your home cool and your wallet fuller!